Pandora's updated app provides new ways for users to see their history of ratings, and change them. Pandora has released a major update to its app for iOS and Android smartphones -- the biggest update in two years, the company says. The interface gets a cleaner design, but more importantly Pandora is now nudging users to provide more feedback about stations and songs they like. 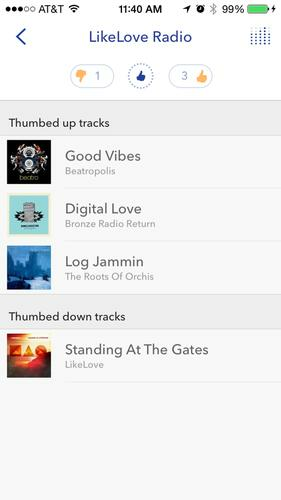 It's also added a new feature that lets users change their thumbs up or down ratings for songs after the fact, providing it with more accurate input. It's part of a plan to keep users active and continually supplying Pandora with data about their likes and dislikes, so it has a greater chance of playing music they want to hear and can keep them from switching to rivals like Spotity or Rdio. "Thumbing is a strong signal to us," said CTO Chris Martin. "Getting every user to thumb more has high value." Users can see what songs they've given a thumbs up or thumbs down to in a new personalization section, where they can update those ratings if they've changed their mind. The section also shows new genres and artists that Pandora thinks you might like. No new forms of data are being gathered with the updated app, Martin said. But Pandora hopes the changes will keep users engaged at a time when there's no shortage of alternatives for streaming music. Spotify and Rdio, for instance, let users create their own playlists instead of asking them to rate each song. Pandora has now collected 45 billion data points about people's likes and dislikes, which it incorporates into its algorithms for deciding which songs to play. It says it has a library of over 1.2 million songs, which it's analyzed by looking at everything from the breathiness of the vocals to the guitar sound and the prevalence of the bass. But the increased feedback Pandora gets will help it play more of what its users want to hear, Martin said. That's assuming they keep busy with their thumbs.